As always, you can rely on Barry M to deliver exactly the shade you expect by the name they give their polishes. Bright Red is exactly that, it's a bright and bold classic red creme that dries pretty quickly and is almost totally opaque in just one coat. I did use two coats for this photo but could have easily got away with one thicker coat. 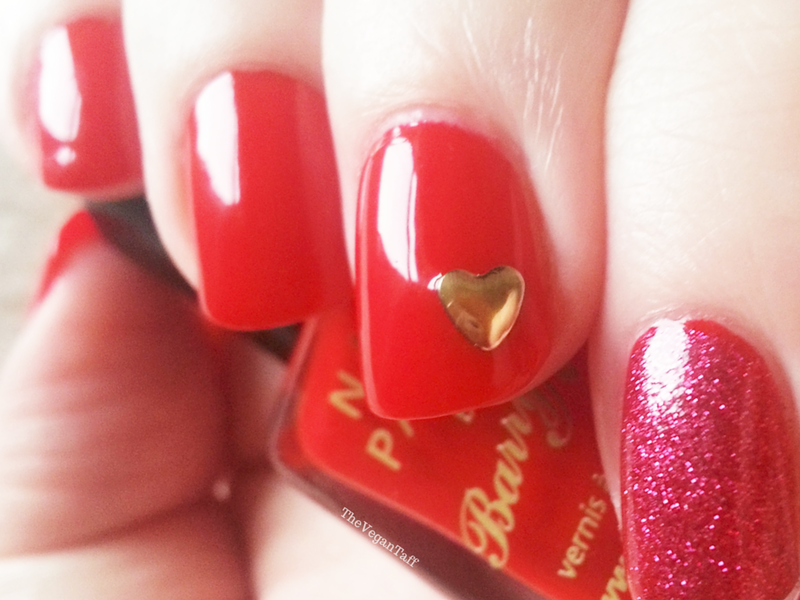 To make the manicure more V-Day appropriate I added a small gold heart stud on the corner of my ring finger, and added a coat of Barry M's Ruby Slippers to my little finger. I topped it all off with a thin coat of Seche Vite because I was pretty busy and needed to get them done as quickly as possible. Bright Red is perfectly smooth and shiny so it really doesn't need a top coat, but Ruby Slippers dries to an almost matte finish so it benefits from a top coat. Barry M's Bright Red and Ruby Slippers are available online and from Superdrug stores nation wide and online for £2.99 each. The gold heart stud was part of a nail wheel I bought from Amazon for £1.09. What do you think of this mani? Have you got any plans for V-Day?